An all-female cast for a crime drama was practically unheard of when ABC premiered Charlie’s Angels on September 22, 1976. Would audiences tolerate a lack of testosterone in a television world inhabited by Erik Estrada? They would, and in substantial numbers. 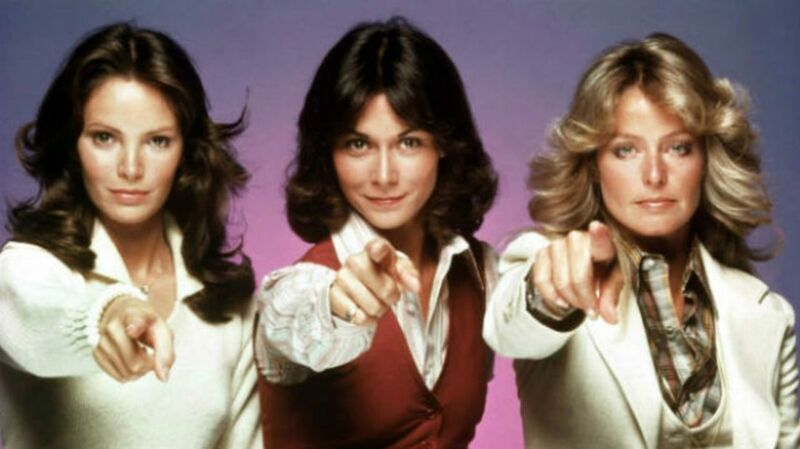 By November, the show was seen by over half of all viewers watching television during its time slot, making stars out of Farrah Fawcett, Kate Jackson, and Jaclyn Smith. Though the show would see regular cast changes throughout its five-year run, it never strayed from the formula: photogenic women caught up in private investigation cases provided by unseen benefactor Charlie Townsend. With its 40th anniversary around the corner, check out some facts about a proposed all-male spin-off, Farrah's abrupt exit, and how the Bionic Man affected their shooting schedule. 1. ABC HATED THE IDEA. ABC network executives Barry Diller and Michael Eisner were not at all sold on the premise of three female leads in an hour-long action series. When producer Aaron Spelling and partner Leonard Goldberg brought the project to them, they declared it “the worst idea we have ever heard.” Because Spelling had a deal from a previous television movie arrangement that guaranteed him $25,000 to script a new pilot, he convinced Eisner that they might as well get something for their money. Eisner agreed, and ABC commissioned a script. 2. THE ORIGINAL TITLE WAS THE ALLEY CATS. The 1970s were a crucial decade for feminism, with women successfully putting forward the idea of gender equality. Which made it a bad time for a network to consider calling a female-led series The Alley Cats, which is what Spelling and Goldberg had originally proposed. Kate Jackson, who had more acting experience than any of the other leads and was initially designated the “star,” preferred it be called Harry’s Angels, after the original name of their unseen benefactor. When his name was changed to avoid confusion over the detective show Harry-O, the series settled on Charlie’s Angels. 3. THE ORIGINAL CHARLIE GOT FIRED FOR BEING DRUNK. Producers decided on the novel concept of Charlie Townsend giving the Angels their case information via a Western Electric Speakerphone and never showing up in person. Spelling hired veteran actor Gig Young for what amounted to a voiceover role, but when Young showed up to record his lines, he was drunk. A frantic Spelling called John Forsythe (Dynasty) at 12:30 a.m. and begged him to perform the part before he had to turn in the pilot to ABC executives. Forsythe drove to the 20th Century Fox lot in his bedroom slippers to do Spelling the favor; he wound up on the show for its entire five-year run. 4. FARRAH FAWCETT’S CONTRACT STIPULATED SHE FINISHED SHOOTING IN TIME TO COOK HER BIONIC HUSBAND’S DINNER. Farrah Fawcett, a.k.a. Farrah Fawcett-Majors, was known mainly for shampoo commercials and for being the wife of The Six Million Dollar Man star Lee Majors before being cast in Angels. While she would shortly eclipse Jackson as the star of the show—her agent, Jay Bernstein, planted her on as many magazine covers as possible—her primary focus was her marriage. Her contract with Spelling stipulated that she was finished with each day’s shooting at exactly 7 p.m. to make it home in time to cook dinner for Majors. 5. AT THE HEIGHT OF ANGELS MANIA, FAWCETT QUIT. The show was an enormous hit for ABC, easily winning its time slot and delivering some of the best ratings the network had ever seen. What could go wrong? Plenty: before the end of the first season, Fawcett-Majors announced she was leaving the show. According to People, marital trouble and a desire to move to film work was behind the departure. ABC, which had a verbal agreement with her, sued. Eventually, Fawcett-Majors was released from her contract conditional on making six guest appearances during the next two seasons. Cheryl Ladd played her character’s sister, Kris Munroe, beginning in season two; ratings remained high. 6. THE SHOW WAS AFFECTED BY DUSTIN HOFFMAN. Kate Jackson was already growing tired of the show’s simplistic narratives when the shooting schedule forced her to pass on an opportunity to star opposite Dustin Hoffman in 1979’s divorce drama Kramer vs. Kramer. The role went to Meryl Streep, who won an Oscar. A dismayed Jackson was alleged to have become more unpleasant on set, prompting producers to let her go before the start of the fourth season. Michelle Pfeiffer was considered before model Shelley Hack was brought in to replace Jackson. 7. THE FARRAH POSTER CAME BEFORE THE SHOW AIRED. Fawcett-Majors adorned more bedroom walls than sheetrock in the late 1970s, having posed for a now-iconic bathing suit shoot that went on to sell over 12 million copies. The photographer, Bruce McBloom, was a friend of the Majors family and had been enlisted by ABC to take publicity shots during the filming of the pilot in 1976. Months later, McBloom got a call saying Fawcett-Majors was the only Angel who had agreed to pose for a poster; she insisted McBloom be the cameraman. He did the session at her house—with the actress swapping out a bikini for the red swimsuit—six months before Angels aired. In 2009, the outfit was donated to the Smithsonian. 8. THE NETWORK ALWAYS WANTED TO SHOW CHARLIE. Forsythe was never seen on camera in the series, but ABC continually pushed for an episode where the women would finally have a face-to-face with their boss. Producer Leonard Goldberg told the Archive of American Television that the network “talked often about the episode where you got to see Charlie. Every year the network would say, ‘Sweeps are coming. Let’s show Charlie.’” Ultimately, they couldn’t be persuaded. 9. THE CLOTHES BUDGET WAS $20,000 PER EPISODE. Charlie’s Angels stuck to its promise of glossy content, with viewers virtually guaranteed the ladies would fight crime while sporting the latest in high fashion. To that end, producers spared no expense in the show’s wardrobe department, allotting $20,000 per episode. (Even the shoes, which were rarely onscreen, were high-end.) Costumes were changed a minimum of eight times per hour. Fawcett-Majors broke some kind of record when, during one of her guest appearances, she sported 12 different outfits. 10. THEY VISITED THE LOVE BOAT. To help draw attention to the 1979-80 season with new Jackson replacement Shelley Hack, Spelling had the team visit the dock of his highly successful series The Love Boat to investigate a $5 million stash of gold and bronze. While the network expected a ratings bump for Hack, it was not to be: the actress was written out of the show by the end of the season. She did not take it well. “A business decision was made,” she told People in 1980. “Change the time slot or bring on some new publicity. How to get publicity? A new Angel hunt. Who is the obvious person to replace? I am—the new kid on the block.” Tanya Roberts became the sixth (and final) Angel for the show’s last season. 11. AN ALL-MALE SPIN-OFF WAS ATTEMPTED. Seemingly misunderstanding the appeal of Charlie’s Angels down to its very marrow, Spelling arranged for a spin-off titled Toni’s Boys. The Boys backdoor pilot, which was part of the show’s fourth season, featured three men going undercover at the behest of a female Charlie named Toni Blake (Barbara Stanwyck). Toni had a friendly rivalry with Charlie, and used a rodeo rider and athlete among her operatives. Spelling promised a series if the public “took to it,” which they did not. 12. REVIVAL ATTEMPTS HAVE RARELY BEEN SUCCESSFUL. Fans have not been kind toward previous attempts to rekindle that ‘70s-era Angel aesthetic. While the Drew Barrymore-produced feature performed well in 2000, its 2003 sequel was a disappointment; Spelling himself tried with Angels ’88, which was victimized by a Writers Guild strike that year, was delayed for so long it became Angels '89 and then never aired; a 2011 revival made it only four episodes. It was recently reported that actress-director Elizabeth Banks (Pitch Perfect) will try again for Sony Pictures.